The 25-year-old intended to blow up a mosque and a synagogue amongst other targets, it’s claimed. UKRAINE SAYS IT has arrested a suspected far-right French extremist with a huge arsenal of weapons who was allegedly planning to attack the Euro 2016 football championships in France. The arrest added to jitters over the staging of European football’s showcase event in France after last year’s jihadist attacks in Paris. Preparations for the long-anticipated event have also been marred by rolling strikes that have paralysed transport and torrential rain that caused flooding along the River Seine and forced tourist attractions including the Louvre Museum to close. Ukraine’s security service chief Vasyl Grytsak said the 25-year-old man intended to blow up “a Muslim mosque, a Jewish synagogue, tax collection organisations, transportation checkpoints and numerous other locations”. Grytsak said he “expressed negative views about his government’s approach to the immigration of foreigners into France, the spread of Islam and globalisation,” suggesting the Frenchman was more of a far-right extremist or ultra-nationalist than a member of a jihadist group. Video released by the SBU security service showed a man whose face was blurred out loading guns and other weapons into the back of a van. 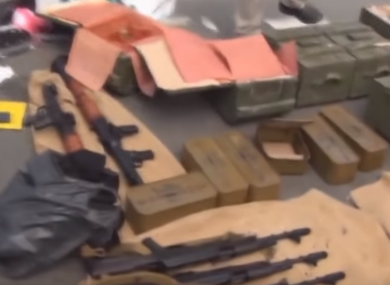 Ukrainian authorities said his arsenal included 125 kilogrammes (275 pounds) of TNT and 100 detonators as well as bullets and grenade launchers. The SBU said he was arrested on May 21 while trying to cross into Poland near the Ukrainian frontier town of Yagodyn. Ukraine’s secret service said it had become aware in December of the arrival of a French national who had begun “to establish contacts with a number of representatives in the (pro-Russian separatist) east”. The man has not been formally identified by French authorities, but he is believed to work for an agricultural cooperative inseminating cows in eastern France. The employer of a man named in some media as the suspect told AFP he was an “exemplary employee”. A farmer who knows the man, but asked not to be named, said he regularly visited Ukraine. “He told us he had a girlfriend in Ukraine and that he went to her place from time to time,” the farmer said. The announcement of the arrest came a day after French President Francois Hollande acknowledged that the threat of an attack during the month-long competition could not be discounted, but promised to “do everything to ensure that the Euro 2016 is a success”. France has mobilised 90,000 security personnel to secure areas with large numbers of supporters, but the increasingly anxious mood in France has cast a pall over a celebrated competition that unites the continent once every four years. The situation has not been helped by a long-running labour dispute. Make-or-break talks between unions and employers today are set to decide whether a rail strike will affect the influx of football fans from around the continent. Grytsak said Ukrainian authorities suspected the French national was trying to obtain arms from unidentified groups in war-scarred eastern Ukraine. “The Frenchman offered people with whom he was in contact (in the east) several thousand euros in order to have a Ukrainian citizen help him carry the load into Europe,” he said. “We therefore believe that the Russian security services may have set him up,” he said. Ukraine’s eastern war zone has been awash with arms since an insurgency against the pro-Western government in Kiev erupted in April 2014. Email “Euro 2016: Arrested French extremist 'had planned to attack multiple targets' ”. Feedback on “Euro 2016: Arrested French extremist 'had planned to attack multiple targets' ”.